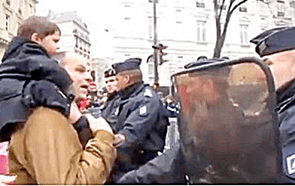 News agencies from France are reporting that yesterday’s NOM approved anti-gay hate march in Paris turned violent when protesters attempted to march down the off-limits Champs Elysees, prompting riot police to respond with force and with tear gas. Christine Boutin, leader of the French Christian Democratic Party, and one of National Organization for Marriage’s speakers at their forthcoming anti-gay hate march in Washington, DC was seen lying on the ground in the Champs-Elysees, after being tear-gassed by police during the demonstration, after clashing with the police herself. John Aravosis, from AmericaBlog is also reporting that anti-gay protestors also attempted to use their children as “human shields” against police. “On met les enfants devant, on met les enfants devant.” TRANSLATION: “Put the kids in front, put the kids in front,” a father yells to other protesters, as he approached the police line with his three-year old child perilously perched on his shoulders right after the police used tear gas and batons, telling the protesters to back up. So much for the anti-gay “it’s all for the best interest of children” lie. OF COURSE THE FRENCH HAVE ALWAYS BEEN ON THE WRONG SIDE OF HISTORY.